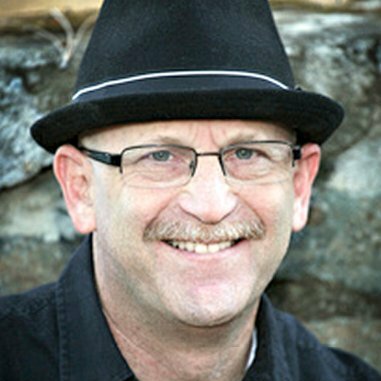 This guest post was contributed by Barry Feldman, founder of Feldman Creative. Inquire with a company to talk about their use of social media and you’re directed to the marketing department. But what if you want to talk about social selling? You might stump the receptionist with that one. The marketing people are one on floor. Sales are on another. They’re kept separate for a reason. They have different jobs to do and don’t work all that well together. But… but… but… This is the age of customer experience. Marketing and sales are trying to engage with the same customer. Isn’t it time they get on the same page? If they’re trying to make hay with this thing we call social selling, they absolutely must. Social selling is about leveraging your social network to find the right prospects, build trusted relationships, and ultimately, achieve your sales goals. Achieving these important objectives can only be realized when sellers are equipped to act as company advocates using relevant content at the right time and place. Planning and creating content is almost always a function of the marketing department. When it comes to social media, marketing also chooses the tools and technology. The prospective customer now goes on a self-guided journey far deeper into the buying cycle. This reality has been documented in every conceivable way. Essentially, if you understand that far more of the buying process now happens online, you understand the challenge. Salespeople are simply left out of the process. Buyers look to their peers and social networks before they engage with traditional sales organizations. Marketing remains in charge of understanding the buyer journey and collecting customer data. This dance generally takes place online. Sales, we assume, excels at understanding what motivates buyers, meeting their needs, and building relationships. This dance generally takes place offline. “There is no question that data-driven social selling can drive sales,” wrote marketing leader Mark Schaefer in The Data-Driven Sales Team: Why Social Selling Works. In the post, with the help of Dell’s Bryan E. Jones, Mark shared research on the impact of social selling in large IT organizations revealing 75% of B2B buyers are influenced by information found on social channels. Getting into, and succeeding with social selling, begins with gaining a firm grasp of how it changes the salesperson’s job—and how it doesn’t. Social selling does not demand sales people retire the processes they’ve always relied on, such as email, phone calls and meetings. The idea is to make these traditional channels more fruitful through the use of social media. Listening—Listening involves monitoring social networks for mentions of your brand, business, or service. Monitoring social media channels helps sales identify possible leads and reduce the need for outbound marketing tactics. A variety of tools including Google Alerts, Mention, even hashtag searches, help cut through the digital noise to identify people who are talking about, interested in and interacting with your brand. Sales can reach out to people who may be “warm” leads and nurture them along the conversion path. Research—The prospect’s social media profiles and behaviors provide a simple means to gather relevant information. Relating—The seller should aim to build a meaningful relationship via well-timed information exchanges. Social media can help salespeople establish authenticity and authority. This, of course, calls on applying content marketing wisely, which is what this article is essentially about. Collaboration—B2B sales call for developing relationships with multiple people on the buyer side. Social tools and tactics help make the process collaborative. Visibility—By participating in relevant conversations via social media on an ongoing basis, salespeople can stay visible throughout the prospect’s unpredictable buying journey. 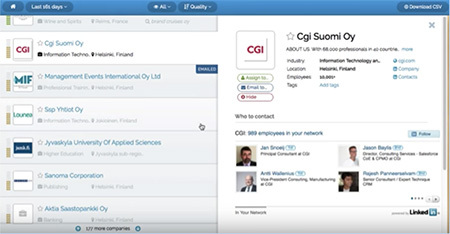 Many of the processes outlined above can be accelerated with the use of today’s fast-expanding selection of social intelligence tools. Social intelligence, according to Social Business News, is the next-generation of social “listening” solutions, which deliver multi-dimensional insight on a brand and its features, promotions, shoppers, consumers and influencers. An interesting—and very easy—tool I’ve begun using is Leadfeeder. A service that leverages your analytics data, Leadfeeder discovers valuable insights about website visitors that have demonstrated interest. Data insights delivered by Leadfeeder include which companies your website visitrs work for, the sources that led to website visits, and the content they’ve consumed on your site. Sales professionals can mine the data to turn cold calls into warm introductions. Recent research from Aberdeen Group makes a strong case that content provides the common denominator for well aligned marketing and sales teams. Top-performing sales organizations use content as a key component of their toolkit and marketing has extensive visibility into how it's applied. Alignment is merely the beginning of an effective social selling coalition. Marketers need to step up and into the process to help empower sales people to succeed. Let’s examine the tasks involved. A salesperson’s social media profile is his or her introduction to buyers, the handshake, if you will. Marketers must not only encourage salespeople to develop robust profiles, they should show them how it’s done. Provide strong examples featuring professional quality photos, strategically optimized bios, and customer-centric copy. Offer support to create great profiles if the salesperson requires it. Offer assistance to embellish social profiles with multimedia content and other high value content, especially on LinkedIn. To gain traction with social media, the members of your sales team may need to “unlearn” some of the sales tactics they’ve come to rely on. That is, they need to ditch the pitch and focus on forging relationships. Again, a combination of demonstrating, training and support paves the path to success. Help salespeople identify which channels to use and how to select professional groups to join. Help salespeople understand prospecting tactics with the appropriate social media tools and tactics such as advanced searches, hashtags, and social media monitoring techniques. Discuss effective social media practices focused on creating and fostering relationships. Marketers need to empower salespeople to have intelligent conversations and meaningful information exchanges based on helpful content. Help sales understand how to use thoughtful content to inspire discussions on social media. Expose sales to relevant content assets they can use. Create systems and processes that make it fast and easy to find the content and deliver it. Identify pain points and customer challenges to encourage opportunities to collaborate on new content. Empower sales to create content via digital channels. Identify external sources of content and opportunities to curate it. 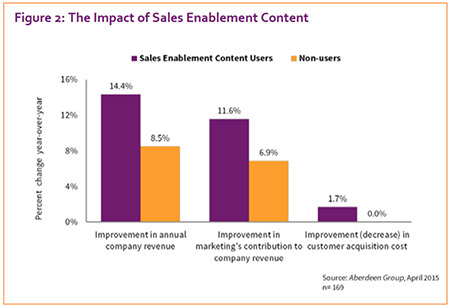 Identify sales enablement opportunities and consider how a salesperson can personalize content for potential customers. Share analytical insights with sales regarding what is and isn’t achieving effective engagement and producing leads. Marketing must help the sales team understand how to use content. This three-part lesson comes from The Executive Guide to Social Selling Success cited above. Marketers should continuously champion social selling internally to help inspire participation from sales. Celebrate wins and showcase them for all to see. Share best practices that have worked and ideas to continue applying. The potential impact of social selling is clear. Top tier social sellers create a professional presence based on expertise, trust and engagement. And ultimately, armed with content and the know-how to use it, they improve sales and decrease customer acquisition costs. A key to success, according to Dell’s Bryan E. Jones, is “transforming the marketing organization first in order to fully support the sales team all the way from training to execution and beyond.” However, an even bigger factor is support from the top. Jones claims that findings show salespeople need the full support of the entire organization. The ideas above are stressed in Social Business Journal Volume 3: Social Selling Research, Insights and Best Practices (By Dell and Social Business Engine). The following great quote also comes from the report, contributed by Mark Schaefer, an educator and marketing consultant, who’s learned from first-hand experience in social selling training programs. “I have provided social selling workshops at a number of large companies and find that a common problem is ‘mass training.’ Cultural change is very difficult and while the intention of the company-wide sales training is often noble, it rarely works in this instance. Content marketing is crucial to aligning marketing and sales around social selling. For a deep dive into the power of content, download The Sophisticated Marketer's Guide to Content Marketing today.